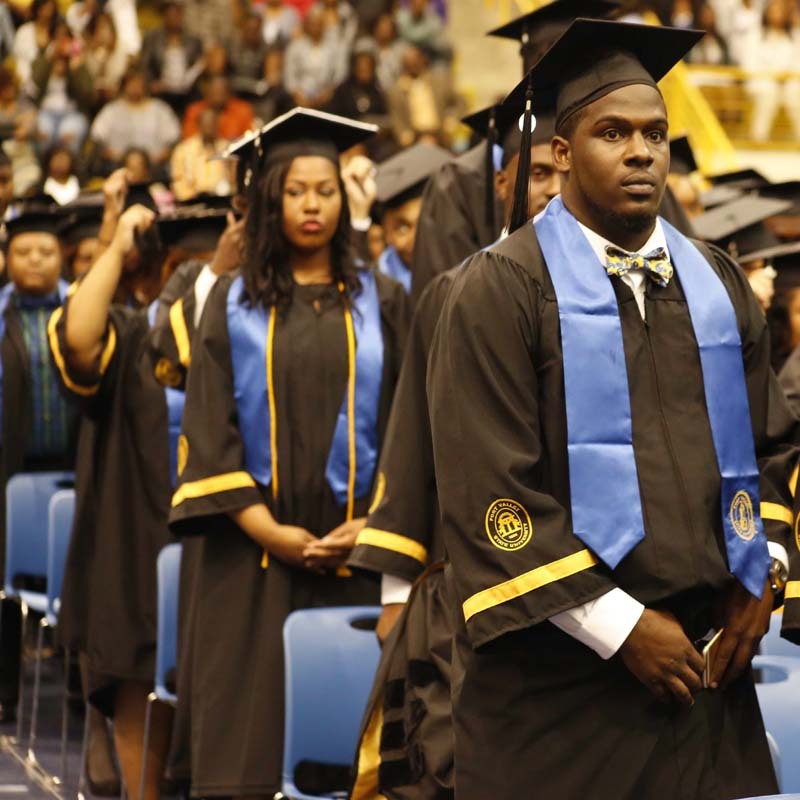 December 12, 2015 – Fort Valley State University graduates received motivating advice from a trailblazer and scholar that overcame significant barriers to make history. This year’s commencement keynote speaker was Dr. Gary A. McGaha, president of Atlanta Metropolitan State College, and the first African American to earn his doctorate degree in political science from the University of Mississippi. Before 293 graduating students and a standing-room only crowd inside the Health and Physical Education Complex, McGaha addressed the crowd. “Students, the future is in your hands. You’re finishing college and graduate school at one of the most important times in this great world, the social effect of this world is really changing the world you will inherit and lead and it is going through rapid changes and creating what is called ‘the new normal’ in all aspects of life,” McGaha told the audience. Before McGaha’s speech, FVSU’s ceremony began traditionally with a rendition of Pomp and Circumstance playing as graduates marched onto the floor. Family members screamed their favorite graduate’s name. Others applauded and held up signs with students names. One of the students entering into the building was Aaron Brown, a graduating senior that earned his bachelor’s degree in biology. The 22-year-old Cuthbert, Ga. native enrolled at Fort Valley State as a member of the African-American Male Initiative. The AAMI a statewide network of programs that helps to increase the enrollment, retention and graduation of African-American males within Georgia’s public colleges and universities in 2011. Brown said the program motivated him to complete college, and also to build long-lasting friendships. Brown also joined the ranks of Beta Kappa Chi, an honor society for students majoring in biology in 2014. This summer, the student interned at the USDA Southeastern Research Lab, thanks to Dr. George Mbata, chair of FVSU’s biology program, and funding from the University of Florida. He studied the effect of weevil soil cells on Bavarian Fungi. He also learned how to inoculate bacteria, nematodes and conduct cadaver dissections of insect larvae. “The internship really changed my mind about what I wanted to do,” Brown said, The student, who originally planned to enter medical school, now wants to pursue a different path. “I want to become a researcher in epidemiology,” he said. The Wildcat student is currently pursuing graduate school. Brown had this advice for students. After Brown and other graduates took their seat, interim president Dr. Jessica A. Bailey welcomed parents to the event. The president recognized several outstanding students including Brenda Rivera-Brignoni, a Colorado native and retired military service member that was raised in San Juan Puerto Rico. Rivera-Brigoni, a nontraditional student, earned her bachelor’s degree in liberal studies during commencement. She is the first to earn a college degree in her family. She also recognized Jasmine Surrency, who earned a bachelor’s degree in education (infant and child development), is a third-generation graduate of FVSU. Her grandparents, uncle and several cousins and great aunts have graduated from FVSU. Bailey also recognized Aaron Allen, Andrew Crosby, Reginald Cuthbert, David Durham, Rodriquez Fillingame and Javier Lowe for being the largest cohort of men to graduate from the College of Education. Each one has already been offered a teaching position that starts December 2015. After Dr. Bailey’s welcome, the Fall 2015 valedictorian Vernita Catherine Beach, prepared to give her speech. Beach, who currently lives in Anchorage, Ala. is a nontraditional online student, salsa dancer and mom who earned her bachelor’s degree in technical writing. Beach enrolled in FVSU’s technical writing program in 2014. Fourteen years ago, Beach married her husband, Quinton Beach Sr., a munitions specialist for the U.S. Air Force. The couple began traveling the world, including stops in Misawa, Japan, and Aviano Italy. Beach also gave birth to four children. She currently lives in Anchorage, Alaska where she works as a family assistant specialist for the National Guard’s Armory in the U.S. National Guard. In her spare time, she teaches Zumba fitness classes. Beach first began attending college at Darton State College in Albany, Ga. She took classes in ballet, dance and biology, and later earned an associate’s degree in English in 2013. Beach wanted to earn her bachelor’s degree in English, and decided that FVSU was the school that best fit her needs. She enrolled in FVSU’s technical writing program in English. When her husband, Quinton, a munitions specialist for the air force, was transferred to Anchorage, Alaska, she was able to continue taking courses from FVSU. The ease of online classes allowed Beach to take them wherever her husband was stationed. She reduced the number of hours that she taught Zumba fitness courses in order to focus on earning the best grades possible from FVSU. Beach was able to use some of her job assignments for her school assignments. Beach was helping her unit to earn accreditation. She submitted some of the paper work she prepared for the application process for technical writing assignments in class. This summer, Beach performed in a salsa dancing festival and also traveled to Costa Rica as part of the National Golden Key International Honor Society. There, she completed a cultural immersion at the Costa Rican Language Academy. While in the Central American country, she also taught elementary students during her two-week stay in August. Throughout her matriculation at Darton and FVSU, Beach earned a solid 4.0 Grade Point Average. The graduate, who says she was never satisfied with anything less than an A, thanked her husband and her supervisor for their support in helping her to complete her bachelor’s degree. The student flew all the way from Alaska to deliver her speech in person. It was her very first time on Fort Valley State’s campus. During her address, Beach told students to keep their integrity, perform random acts of kindness and find a way to connect with others. She said that feelings like uncertainty and insecurity can be used to effect a positive change. After Beach’s speech, Dr. Bailey introduced Dr. Gary A. McGaha, president of Atlanta Metropolitan State College. She presented McGaha with a trophy of excellence for his commencement speech appearance at the 2015 Fall Commencement. McGaha told students he had a special relationship with FVSU, since his son Gabriel is an 2004 alum from the university. McGaha told the audience that his son didn’t want to attend college: he wanted to play soccer. McGaha met FVSU professor Curtis Martin. After talking to the professor, he was inspired to send to FVSU’s campus. Eventually, his son graduated from campus, went to law school in Europe and is now working for the federal government. “I owe it to FVSU, and the outstanding faculty and staff hat wrapped their arms around him and turned him into tremendous person.” He told students that they would be facing challenges that included a resurgence of racism, a decreased life expectancy and other threats. He told students that they are walking representatives of the university. “Think about what you have had to overcome to get to this point,” McGaha said. “Your graduation is a blessing to God. Think about all those assisted you to make this graduation a reality. You are the new face of this great institution. I challenge you to take your responsibility seriously.” He advised students to make a plan, rely on internal motivation, and spend time to become an expert in their field. Following the keynote address, students lined up at the stage for the conferring of degrees. They received their college diplomas from College of Graduate Studies and Extended Education dean Rayton Sianjina, College of Agriculture, Family Sciences and Technology Dean Govind Kannan, College of Arts and Sciences Dean Uppinder Mehan and College of Education Dean Edward Hill Jr. as family members cheered. Later in the program, three graduating ROTC cadets Tamarah J. Richardson, Jasmine McGauley, and Myles T. Bailey were commissioned to second lieutenant in the U.S. Army. To view/purchase photos from the commencement, visit https://fvsu.smugmug.com/.